Sir David and A Rocha UK’s Conservation Director Andy Lester were both on the speaking team at the Conference For Nature event in Church House last week (3 September 2014) – which drew more than 250 people, including other experts from across the environmental lobby. 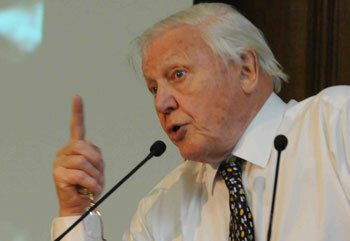 Just before the event, Sir David urged religious leaders to pursue conservation. "From you and I in our own domains, from business magnates to politicians, and from farmers to faith leaders, everyone has an opportunity to save nature," he said. "With an increasing global footprint, mankind is intensifying the crisis for wildlife, but as individuals we can all be a part of the solution for saving it, too," he said. "A Rocha UK is thrilled to be involved with this event," Andy said later. "This has provided us with a unique opportunity to showcase the work of the faith community nationwide – and confirm that the Church is both willing and able to get its hands dirty for God's incredible world." Following up issues raised by last year’s ‘State of Nature’ report, the conference attracted key figures from industry and Government. It was organised by the State of Nature Partnership – a coalition of 26 NGOs, including RSPB, The Wildlife Trusts, A Rocha UK and Butterfly Conservation. "Last year’s State of Nature Conference set out the context for the devastating declines in some of our best-loved species, such as the Turtle dove, Common toad, and Atlantic salmon," said RSPB’s Chief Executive Mike Clarke. "However, saving these and other threatened species requires inventive solutions and creative partnerships with many sectors, underpinned by a meaningful commitment from Government. This conference is the platform for all to come together and achieve just that." A Rocha UK's Chief Executive Officer Mairi Johnstone welcomed the 'joined-up thinking' between business, Government and civil society. "It's absolutely necessary in the battle to win the hearts and minds of the general public on the issues at stake," she said.